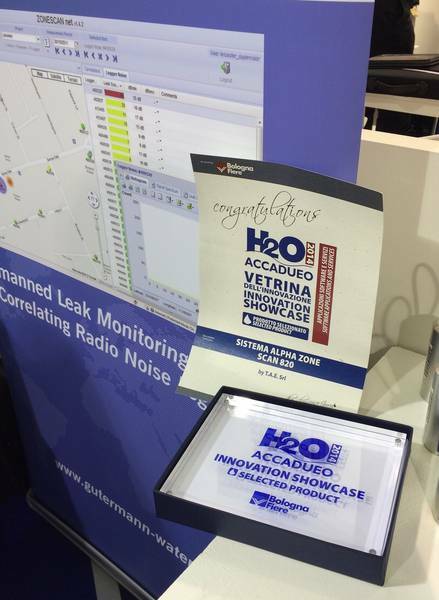 Among "over 170 participating products and companies" at H2O Accadueo's innovation showcase in Bologna, ZONESCAN ALPHA won the "Best New Product" Award in the category "Software Applications and Services"
This award is the 7th such recognition for ZONESCAN ALPHA (permanently deployed correlating radio loggers with automatic leak alarm) and ZONESCAN NET (cloud-based user interface for ZONESCAN ALPHA customers with geospatial mapping and analytical tools for leak pinpointing) since 2012. At this event the selection focused on the three most impressive new products belonging to the four macro-categories: Software and service applications; Mains and wells; Pumps, machinery and systems; Instrumentation. The jury made its decision based on the following: "The software and service applications sector expands its variety of application platforms designed to satisfy management demands for resources such as water, gas, district heating, and electricity to provide local and remote network supervision, assess system efficiency, search for leaks, control pressure, manage pumping stations, coordinate territorial offices, store and display energy consumptions, etc., so that individuals involved in planning and management can make decisions with greater knowledge and awareness."